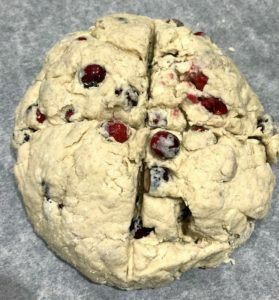 Mix the flour, bicarb, salt, sugar and cranberries in a bowl. Pour in the buttermilk and stir together. 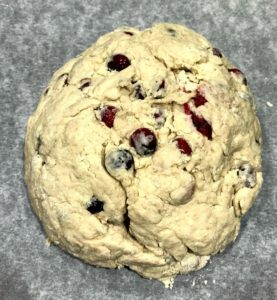 Bring together with your hands then transfer the dough to a floured surface and form into a round loaf shape. 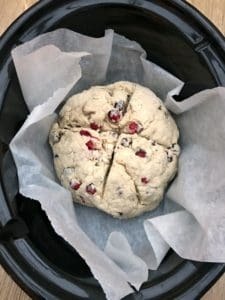 Line your slow cooker pot with baking parchment and place the loaf inside the pot. Cook for 2 hours on high, with a tea towel under the lid. For the last half hour, turn the loaf over to brown the top. 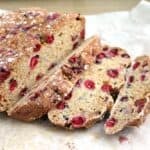 Remove from the pot and allow to cool, dust with icing sugar then slice to serve.